As a Board Certified Executive Coach, Jenifer Hill uses evidenced-based approaches to help leaders identify ways to manage and improve development areas while cultivating both personal and professional strengths. Jenifer is described by others as a dynamic, challenging and thoughtful Executive Coach, dedicated to providing a supportive and motivating environment. Grounded in a person-centered philosophy, she believes in an individual’s ability to develop and grow. 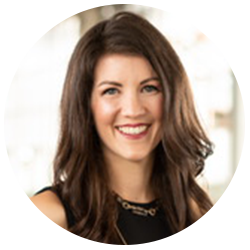 As a telos consultant, Jenifer incorporates the appropriate assessment tools, sound logic, up-to-date evidenced based approaches and concrete steps, all while adhering to the leader’s individualized development plan. After eight years as a mental health professional, Jenifer transferred her diverse clinical experiences towards a development focus. These experiences quickly catapulted her into the world of leadership development consultation and Executive Coaching. Jenifer has provided trainings, assessment and development center facilitation, feedback, Executive Coaching and more, to approximately 800+ leaders, from the Manager to C-Suite level, across the globe. Dedicated to delivering customized consultation, training, and coaching, she was worked in a variety of industries, including but not limited to, healthcare, pharmaceuticals, technology, manufacturing, and insurance. A true “learner”, Jenifer enjoys development in a variety of facets. From practicing yoga and exploring the outdoors to engaging with new people; she is passionate about pushing herself, and others, to build upon their strengths while implementing innovative ideas, to live life to the fullest! Jenifer resides with her husband and son in Canton, Ohio.